In anticipation of another devastating winter with below freezing temperatures, we decided to push for a new initiative at Zam Zam - a clothing drive for the children of Gaza, Palestine. Our initial goal was to raise $15,000, which would go towards purchasing winter bundles for the children of Palestine. Each bundle of clothing included: sweaters, gloves, socks, shoes, and undergarments. For the past five years, Freshta Kohgadai, Rahat Mawlavizada and I have done similar winter drives, independent of Zam Zam, resulting in $3,000-$13,000 of funds raised per year. Therefore, this year’s goal of $15k seemed relatively attainable. Once we had launched our campaign, magic happened. Our initiative spread like wildfire, and the donations poured in due to the Zam Zam following, as well as, the undying generosity of the Palestinian-supporting community, including our partners at PaliRoots and MECA. We achieved our goal in a matter of days. Our goal of $15k became $25k, then $30k and beyond. I can still recall the conversation over the phone with Yusuf, founder of Zam Zam, telling him that we’d close out at $50k, fortunately, I was wrong. At the end of our drive, our donors exceeded all of our expectations and we ended the campaign at approximately $67,000, an astonishing $52,000 more than our initial goal. 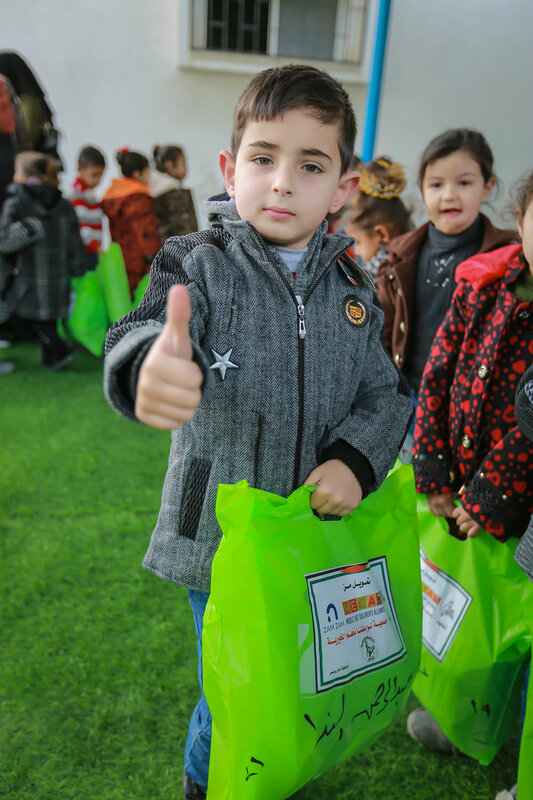 We were able to provide nearly 2,700 Palestinian children with winter bundles which helped them survive their chilling winter. Aside from providing warmth, we provided jobs and stimulated their local economy because all items were manufactured and purchased directly in Gaza. More importantly, we gave these children something more valuable than just clothing; we gave them hope. The priceless expressions of joy indicated that they felt our love from afar. To be able to provide care to nearly 2,700 children is a feeling that I’m still trying to grasp. That’s 2,700 smiles. 2,700 dreams. Lives that may have been sadly cut short, were it not for our supporters. On behalf of Freshta, Rahat, and the entire Zam Zam family we are eternally grateful for your contributions. We appreciate all of your efforts whether it was a donation, sharing our campaign, or simply engaging and bringing awareness to the the plight of the Palestinians; you made a difference. We would like to share some pictures of the children, which you've protected from frigid temperatures, as they receive their warm clothes. As you see the faces of these angels, our hope is that you feel a sense of fulfillment knowing we achieved this goal together.